In this week's Market Movers: Major players in the OPEC/non-OPEC coalition will be in Moscow this week for Russian Energy Week, which starts Wednesday. The market will be closely watching meetings between Russian Energy Minister Alexander Novak and his Saudi counterpart Khalid al-Falih and Iranian oil minister Bijan Zanganeh. While the oil markets will be making a date in their diary for Russian Energy Week, the key date for the sugar market is October 1st, the first day of the new sugar season in Europe. This is the focus of this week's social media question: What do you think this season will bring the European sugar market? Tweet us your thoughts with the hashtag #PlattsMM. October 1st also marks the split of the German-Austrian power price zone. This week, traders will be watching for the impact on Austrian spot settlements. The split follows years of debate, after unscheduled flows of surplus German power via Eastern European power grids. Europe's petrochemical industry will be converging on Vienna on Sunday for an annual gathering. EPCA will run from October 7th to 10th, with the confernece's theme being petrochemicals and the low-carbon economy. And finally, the Italian natural gas market will be under pressure this week from a reduction in Russian gas flows. Join our conversations on Twitter - use #PlattsMM and connect with us. In this week's highlights: The new sugar season kicks off in Europe; the German-Austrian power price zone will split; and the world of petrochemicals will head for Vienna. But first: Major players in the OPEC/non-OPEC coalition will be in Moscow this week for Russian Energy Week, which starts Wednesday. The market will be closely watching meetings between Russian Energy Minister Alexander Novak and his Saudi counterpart Khalid al-Falih and Iranian oil minister Bijan Zanganeh. 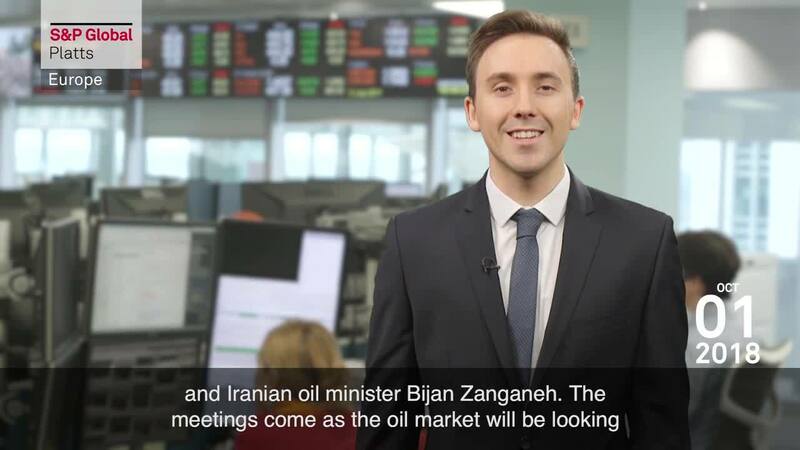 The meetings come as the oil market will be looking to see if there will be a rise in prices as renewed US sanctions against Iran come into effect. There are sharp differences between US ally Saudi Arabia and Iran over whether the coalition should raise or cut crude output. Away from the controversies over Iran, the entire who's who of the Russian energy sector will attend the event, at which topics as diverse as coal and Arctic shipping routes will be discussed. While the oil markets will be making a date in their diary for Russian Energy Week, the key date for the sugar market is October 1st, the first day of the new sugar season in Europe. Total EU production is expected to be as much as 2.5 million metric tons less than last season's record high 21.2 million because of lower beet yields. But even that won't be enough to offset the world's massive sugar glut. Platts Analytics unit Kingsman forecasts the surplus will be nearly 12 million tons this season. As you can see from the chart, the result of the surplus is that EU domestic and export as well as global white sugar prices are hovering around multi-year lows. Market participants will be looking to see if this causes farmers to move away from planting sugar beet, reducing sugar production further in the 2019-20 season. That brings us to our social media question of the week: What do you think this season will bring the European sugar market? Tweet us your thoughts with the hashtag #PlattsMM. October 1st also marks the split of the German-Austrian power price zone. This week, traders will be watching for the impact on Austrian spot settlements. The split follows years of debate, after unscheduled flows of surplus German power via Eastern European power grids. Capacity constraints are now in place on the German Austrian border. The impact on Germany is expected to be limited, especially due to a new interconnector on the Dutch border. But the impact on Austrian spot settlements will determine future spreads between Germany and Austria. When the Austrian and German power markets split up their Irish counterparts will get together. On October 1st, the Integrated Single Electricity Market in Ireland between Northern Ireland and the Republic of Ireland will be launched. I- SEM [pronounced eye sem] is expected to prove the benefits of integration on the electricity market. But its success is still at risk if the UK, of which Northern Ireland is part, exits the EU's Integrated Energy Market without a deal. However, the US- China trade war, US sanctions against Iran and economic uncertainty in Turkey will also be major topics of discussion. Platts petrochemical team will also be attending. Drop in and meet them at the Platts suite in Ballroom C at the Marriott Hotel. And finally, the Italian gas market will be under pressure this week from a reduction in Russian gas flows. Maintenance at the Tarvisio entry point on the border with Austria will cut its capacity by 72%. This will force Italy to look to Northwest Europe for supply. Thanks for kicking off your Monday with us and have a great week ahead.